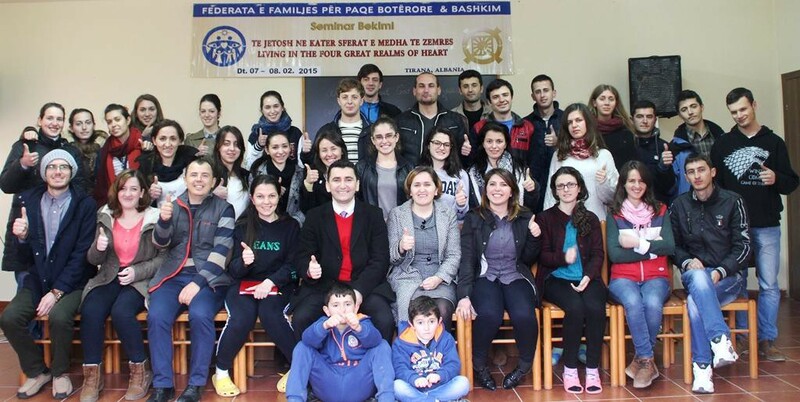 FFWPU Albania, by Marjeta Rroshi, Blessing Department, February 7-8, 2015: We are pleased to share with you this report on Blessing Preparation Workshop that as held from 7-8th February 2015 in our Training Centre in Mullet, Tirana for members who already applied and for those who are candidates to apply for matching. 32 brothers and sisters could participate from all our 8 communities. It was more than one year that we didn’t have such a workshop for members and members felt the need for such workshop to get more information how to prepare for the Blessing. The atmosphere, even though in a rainy weather, it was very familiar as all of them knew each other and everyone joined naturally in any kind of duty that was requested. The workshop started on Saturday afternoon with 3 lectures which were focused on 4 Great Realms of Heart, how did God felt during creation and during the fall of Adam and Eve and the consequences at all humankind, the change of blood lineage, and how members need to prepare for the blessing based on True Fathers words on matching and blessing. The next day were presented two lectures. The first lecture explained the process of application and matching, and the second one gave a deep insight about the Cosmic Blessing. A beautiful moment was the testimonies given by members who received the blessing last years, Jorida Haziraj and Ardys & Enrida Bushi. With tears and laughs they shared with all the participants their emotions from the moment of matching application until the Blessing Ceremony in Korea. They shared their most beautiful and difficult moments they had with their partners. In the reflections of participants, which was organized with prepared questions, it was mentioned that they need to have more often such workshops, longer in days, deeper content on the importance of matching and blessing, more from True Father’s words and more testimonies from members who received blessing, especially older members. Which were most important from the topics or issues you heard? Would you like to hear more content that what was presented on this workshop? “I would like to listen more on the influence that Blessing gives in the daily life and the experiences of blessed families in practicing true love and in education the second generation”. Which is your opinion on the actual matching system?